For many, a prison sentence is the end of life as they know it, but for Mohai Mohai, prison saved his life and improved his health. Mohai Mohai, a 23-year-old married man, served four months in the Botha-Bothe Prison in Lesotho from January to April 2018. While there, Mohai received a complement of health services, including HIV testing and counseling, through the Comprehensive HIV Testing Services, Adherence and Treatment Services for Inmates (CHATSI) program. 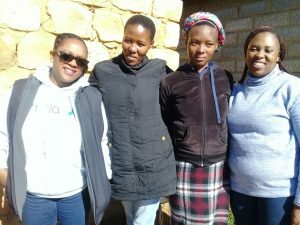 CHATSI, which means “vigilance” in Sesotho, is funded by the Elton John AIDS Foundation and implemented by Jhpiego in collaboration with the Ministry of Health. The program offers a comprehensive rehabilitation and wellness package for prisoners in the districts of Butha-Buthe, Mokhotlong, Thaba-Tseka, Quthing and Qacha’s Nek in Lesotho. Besides HIV prevention, testing and treatment, services include TB symptom screening, laboratory testing and treatment, screening for hypertension, diabetes and other non-communicable diseases, and HIV pre-exposure prophylaxis for inmates. Emotional and psychological support are offered to those released back into the community, ensuring they are linked to care and treatment services. Matšabelo Mohai (second from right), whose husband is living with HIV, received support for a healthy and HIV-free pregnancy from the Butha-Buthe clinic and CHATSI staff. Photo by Thato Diaho. During one of the health sessions with trained CHATSI officers and peer educators, Mohai decided to learn his HIV status. His positive result was particularly stressful to him knowing that his wife was pregnant with their first child. The CHATSI team encouraged him to start treatment the same day as part of their test and treat service, but he decided not to take medication immediately. Upon his release from prison. Mohai was referred to the clinic closest to his village for further counseling, care, treatment and support. His information was also documented in the prison’s discharge and linkages register. Two weeks after Mohai’s release, the CHATSI team, in collaboration with the Butha-Buthe Correctional Service Clinic, followed up and visited his home in the outskirts of the Butha-Buthe district. During the visit, Mohai revealed that he had not yet started antiretroviral therapy and shared that he was struggling to disclose his HIV status to his wife and family. With support from the visiting team, Mohai decided to attend the village clinic for couples’ HIV testing with his 20-year-old wife Matšabelo Mohai. He was retested and his result was the same, positive, but his wife received a negative HIV result. After counseling, Mohai immediately started taking antiretroviral therapy, and his wife was recommended to use pre-exposure prophylaxis to protect her from acquiring HIV and to help ensure a safe and HIV-free pregnancy. HIV is not new in the Mohai family–Mohai’s father, Lesole Mohai, 57 years old, has been taking antiretroviral therapy for more than 10 years. Mr. Mohai’s youngest son, Fusi Mohai, was diagnosed with HIV at 16 years old when he went for voluntary medical male circumcision provided by Jhpiego in Leribe. Through CHATSI visits to the Mohai home, the father said he learned more about taking care of himself and how he can support his family members who are living with HIV. “As the head of the family, I will make sure that my son adheres to his medication and vow to support the couple in their journey as I understand what they may be going through. I urge the CHATSI team to pay regular visits so they can get strength and support,” said Lesole Mohai.